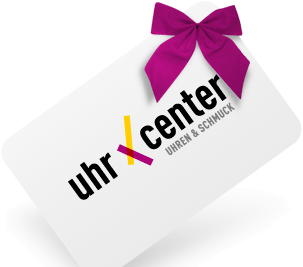 uhrcenter gift vouchers are always the perfect present! Sometimes it can be tricky to find the right gift. With our gift vouchers you can give the recipient the freedom to choose what they really want from our huge variety of watches and jewellery - without any gift-giving headaches. We will send you an email with the uhrcenter gift voucher as a PDF. You can then print out the voucher or forward it to the recipient by email. We will send the voucher to the recipient by email and enter for you the names of sender and recipient as well as a greeting. Do you have a voucher and would like to redeem it? You will find a step by step guidance of how you can redeem your voucher very simply on our voucher help page.